There’s less than a week until the start of the 14th Annual Evans Data Developer Relations Conference in Palo Alto California (March 25-27). With 6 keynote speakers, break out sessions, workshops, a Sunday boot camp, round table discussions and loads of time for networking, this year’s conference will be a spectacular opportunity to move your developer program to higher levels of success. 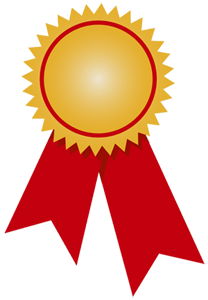 There are only a few seats left for this one of a kind conference focused on developer relations best practices, developer program excellence and optimal developer outreach. Reserve one of the final seats! Here are a few of the “can’t miss” things that are happening during the conference. Janel will draw on multiple recent Evans Data development surveys to give a broad overview of the current development landscape spanning Cloud, Big Data, AI, Machine Learning, Mobile and IoT. Who are they? What makes them tick? What do they accomplish? 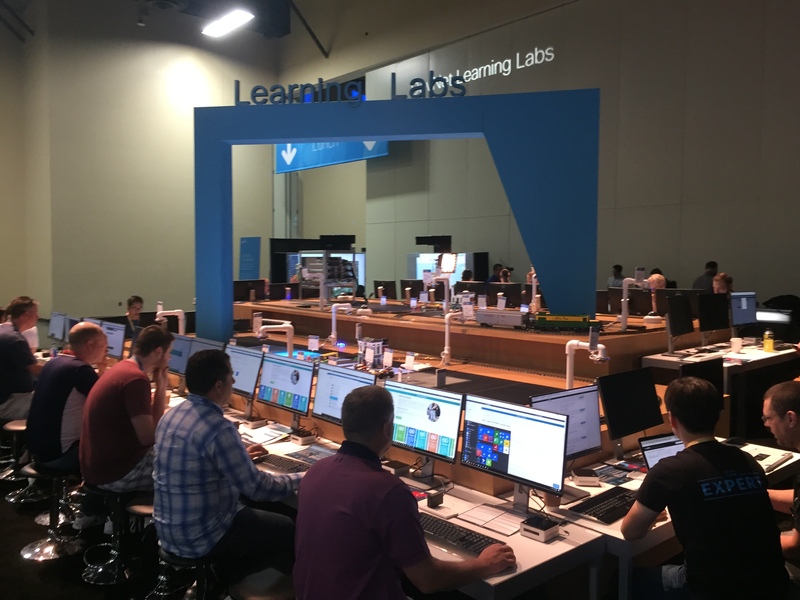 In this session, you’ll get a behind the scenes look at how the Alexa evangelism team operates and what we strive to achieve. Jonas will discuss how IBM has, in less than 12 months, changed its developer engagement strategy, changed the senior executive teams perspective of the developer economy, and rallied the entire company behind the mission to become the most trusted and respected technology company in the World. David Intersimone (“David I”), Evans Data’s Vice President of Developer Communities, will host a conversation with Guy Kawasaki covering developer relations best practice and experiences. They’ll also take questions from conference attendees. Kawasaki was chief evangelist of Apple and David was chief evangelist for Borland/Embarcadero Technologies’ Developer Tools Group. For decades Intel has partnered with software developers around the world to define, deliver, and improve their products. Learn how Intel co-designs user-focused platforms with the software ecosystem, makes it easier for developers to better harness the capabilities of Intel products, and helps ISVs to better sell their software products. This talk will provide specific examples from IOT, Artificial Intelligence, PC Gaming, and Virtual Reality to make it all fit together so that end-users are delighted and developers can grow their business. Open source is ascendant. Digital platforms are shaking up the Fortune 500. Cloud is eating the glass house. As stewards of the profession, we share an awesome responsibility to define new best practices for developer relations in a changing world. 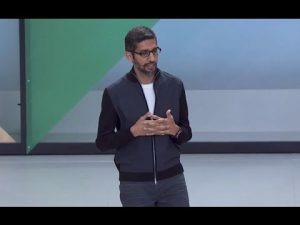 This presentation shares what we’ve learned at Google on the journey we all are on to the future of Dev Rel. Our panel of experts will discuss the future of developer programs and how new technologies are reshaping the features, conversations and deliverables for every developer community. Join your colleagues for in-depth roundtable discussions on topics that matter in Developer Relations, including: Measuring ROI and Metrics, Utilizing Social Media to Attract and Engage Developers, Scaling a DevRel Team, Running Hackathons and Events, Effectively Communicating with Developers, API success factors, Educating and Training Developer Communities, and the Art of Internal Evangelism. 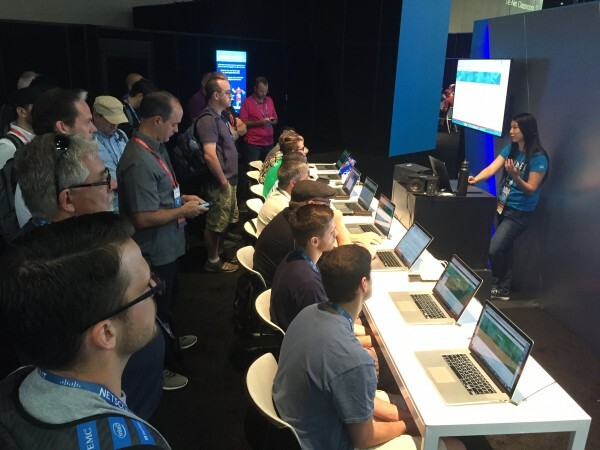 Live Onstage Developer Focus Group – This is your chance to ask developers what you want to know – a panel of developers answer the questions you submit. To accurately target the developer market for your tools and services, segmentation is vital. This is commonly done by classifying developers by the types of applications they create. This typology is valuable and delivers results focused on developer targets, but sometimes you might want to look at developers by other segments. This interactive workshop looks at how various ways to segment the developer population and provides a jumping off point for examining developers that will allow you to expand your reach. A key component of a mature developer relations strategy is the effective use of community. How do devs on your team communicate and collaborate? What is the average amount of time it takes them to get answers? What if you could reduce the amount to time your team spends hunting down resources and resolving issues? A productive and engaged developer community can help your company reach its goals faster and cheaper, but it doesn’t happen overnight. Attend our workshop for a hands-on planning workshop that walks attendees through the process of launching an online developer community that is sure to be a success. Developer Market Segmentation: Who are developers and what do they want? Digging Deeper: Understanding Developer Motivations. 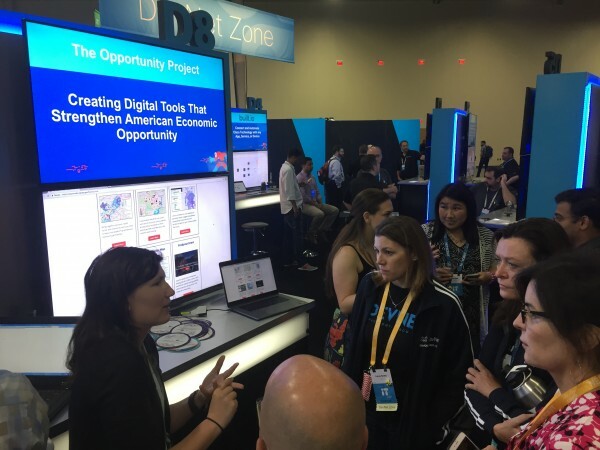 Outreach in the Enterprise: Using Hackathons to Create Culture Change at HP Inc. The Evans Data Corporation’s Developer Relations Boot Camp provides a solid foundation on which you can build or enhance your developer program. Concentrated sessions in this one-day instructional program provide the insight and actionable information you can use to build your brand and establish strong relationships with your developer community. 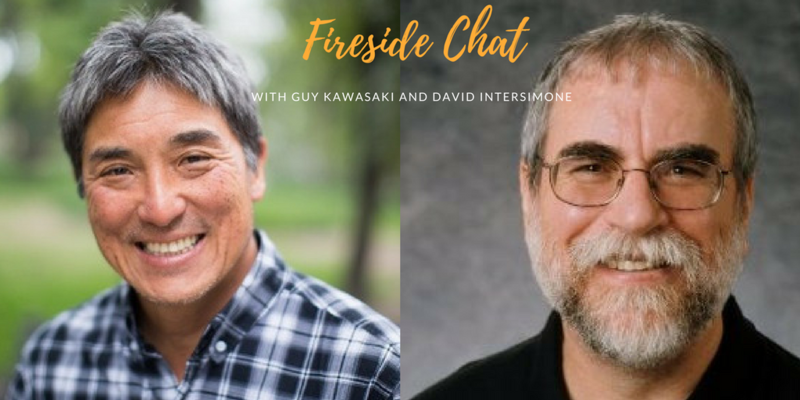 At the upcoming 14th Annual Evans Data Developer Relations Conference (DRC2018), Guy Kawasaki will participate in a “Fireside Chat” with David Intersimone “David I”. During the keynote, David I will ask Guy Kawasaki a series of questions covering developer relations best practice and experiences. They’ll also take questions from conference attendees. 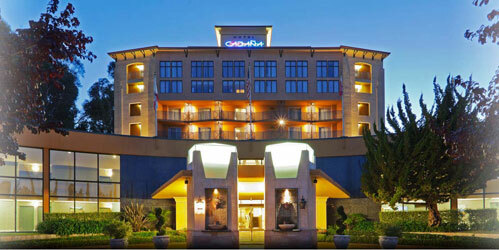 This keynote session will take place on Tuesday, March 27 at 11:15am at the Crowne Plaza Hotel in Palo Alto California. Guy Kawasaki was chief evangelist of Apple and David was chief evangelist for Borland/Embarcadero Technologies’ Developer Tools Group. David Intersimone, known to many as David I, is a passionate and innovative software industry veteran who extols and educates the world on developer tools, software development and software architectures. 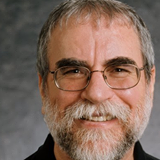 David I joined Borland Software in 1985 where he practically invented Developer Relations. During David I’s forty-three years as a developer, development manager, developer community executive and chief evangelist, he has created a thriving global developer community, thousands of articles, videos and blog posts. Before Embarcadero acquired the developer tools business from Borland Software, David spent more than 20 years with Borland in various evangelism, engineering, and development capacities, including creating the company’s developer relations program. Today, David I shares his visions and insights as a pioneer in developer relations with program managers and directors through Evans Data’s Developer Program Advisory where he gives workshops, guidance and advice on program creation and enhancement and through the DevRelate Developer Program community website. 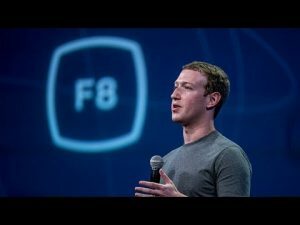 The conference takes place on March 26 and 27, 2018 at the Crowne Plaza Hotel in Palo Alto California. There is also a Sunday, March 25 Developer Relations Bootcamp strategic workshop that provides a solid foundation on which you can build or enhance your developer program. Concentrated sessions in this one-day instructional program provide the insight and actionable information you can use to build your brand and establish strong relationships with your developer community. During the two day conference the keynotes, sessions and workshops will cover all aspects of developer relations, ranging from the business side (program ROI, the connection between developer programs and company revenue, budgeting for/costs of developer programs, how to get an organization’s commitment of internal resources, etc.) to the marketing side (techniques for recruitment, awareness tactics, community loyalty building programs, legal/privacy and global privacy considerations, conducting a privacy audit, internationalizing a US-based developer program, etc), and much more. Whether you are starting a new developer relations program or building on a current one, you deserve all of the help you can get – and this is the place to get it! You’ll find additional Developer Relations Conference information, keynote presenters, speakers and conference schedule on the DRC2018 Web Site. I am a speaker at the API World 2017 conference taking place in San Jose California September 23-28, 2017. The Conference, run by DevNetwork, is the world’s largest vendor-neutral API conference and expo, organizing the API Economy. API World is dedicated to the mission to be independent and facilitate connections, knowledge, trust and business within the developer community of API providers and consumers. My talk takes place on Wednesday, September 27 from 11:00am – 11:50am. I am part of the API World API Marketing track during the conference. Today more than 80% of developers belong to one or more developer programs. Sixty-two percent of developers, in a recent Evans Data Developer Program research survey, say they don’t use APIs that aren’t supported by a Developer Relations program. What motivates a developer to want to adopt a particular technology or tool? What motivates them to buy? The answers to these questions are crucial to the success of API marketing efforts. In order to sell a product, companies must be able to first, reach developers, second, provide a clear and unique message that emphasizes the particular value and functionality of their tool or platform, and finally, convince developers that these offerings can benefit them and/or the company they work for. Knowing what the primary influences are in the developer world is critical. In this API World session, you’ll hear about the many aspects of successful API adoption, developer program features and developer marketing best practices that lead to a successful partnership between your company and developers. 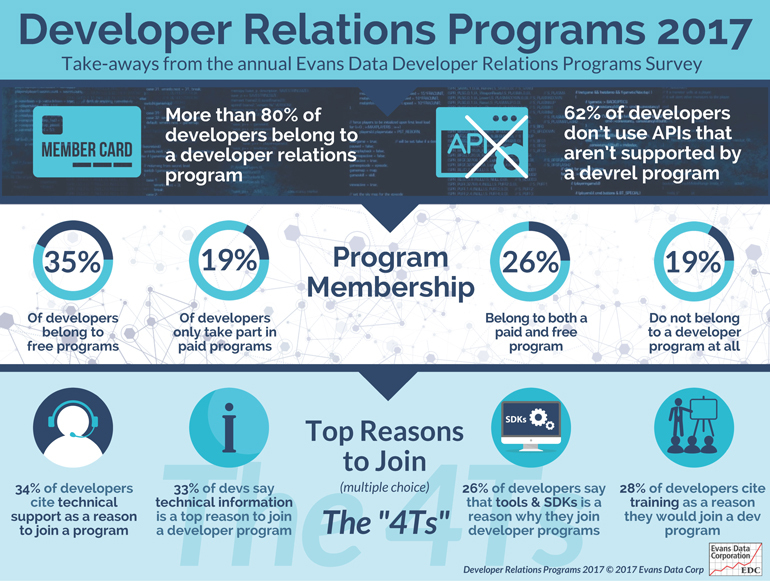 In creating my API World talk I will be using developer focused research that is included in this year’s Evans Data “Developer Marketing Survey 2017” and “Developer Relations Survey 2017“. During API World, I will also be roaming around the conference and exhibit hall. 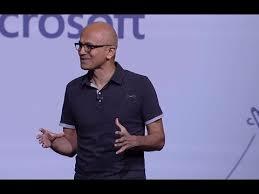 It will be awesome to see all of the companies that are providing APIs for developers to use. If you have time, stop by my talk and say hello.